I’m A Celebrity 2015: Brian Friedman is the second campmate eliminated! 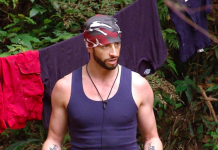 Brian Friedman has been eliminated from the I'm A Celebrity 2015 camp. Susannah Constantine was the to be eliminated. I’m A Celebrity 2015: Line-up confirmed! The new set of celebrities set to enter the jungle this year have been confirmed, see below for the official I'm A Celebrity...Get Me Out Of Here 2015 line-up.